After several burger tours far outside the South Bay, it was time to bring the tour home. What better place to visit than Hermosa's own Suzy's? For those who don't know, Suzy's has consistently ranked among the best burger establishments and venues for live entertainment in the South Bay. It was time for Burger Tour to pay Suzy's a visit. Making a reservation with Suzy was easy. I was able to work everything out with Suzy over email and she was more than happy to set up some great happy hour deals for us. Best of all, entertainment was provided by Philip Clark, LA's own ambassador of soul. Philip delivered. Suzy has some fresh takes on the burger. The Benny Burger, one of the favorites, replaces the traditional hamburger bun with sourdough bread. Throw in grilled onions, swiss cheese, bacon, and fresh tomatoes, and you've got one tasty burger. 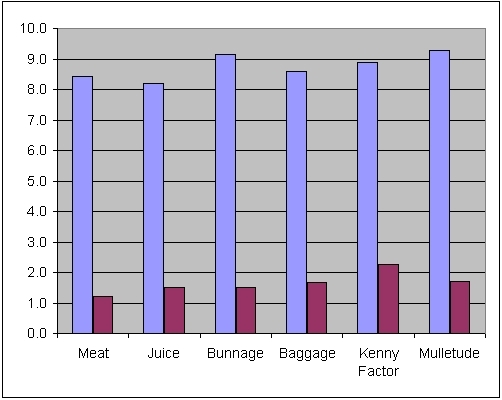 Not only did Suzy do very well on burger scores, but mulletude rated very well. If you're looking for a great burger, a good happy hour, casual atmosphere, and some live entertainment, give Suzy's a visit. We really liked Suzy's and think you will too.